“Do You Work Out?” I find this question difficult to answer. I’m never sure what they are asking but it was even worse when I was single. Then I thought it was a code phrase for another question. Are you asking do I go to a mirrored room and lift weights, not because they need to be somewhere else, but just to put them back in the same spot? Do I run laps of something, even if no one is chasing me? Do I dancercise to music that makes my head want to explode? No. The Dude Rancher and I do practice Yin Yoga. That’s where you tie up yourself in a knot and breathe for a while. I don’t think that qualifies as working out really, but we always smile at each other on the way home. I don’t work out, I train horses and riders. It’s outdoor work, I have an unwanted tan in the middle of winter. Sunscreen doesn’t work as much as I do. I wear out boots regularly and I think they should last longer. Recently I got a new smartphone that has a footstep counting app. It seems I am in the extremely active footstep category. I notice knowing how many steps I take makes my feet a little more consciously sore, and maybe those boots actually were well made. For someone with a desk job. I don’t work out, I do chores. Infinity Farm is a small place, and I am that odd sort who loves mucking. Each week I haul off around a ton of manure. Literally. I muck it into tubs, lift the tubs into the trailer, and then off-load the trailer at the recycler. I save enough money each month to feed one of my retired horses, and I think it strengthens my ‘retirement’ plan as well. Two tons of lifting a week is a lot, it would be gratuitous to add in the hay and feed I carry. But no, I don’t lift weights. A while back, my monthly load of hay was delivered by a couple of new guys. They were 20-ish and had spent a little too much time cowboy dressing, if you know what I mean. They were bragging about riding bulls. (Just for the record, I’m not a fan of bull riding. I think it’s just silly.) They were clearly trying to show off and it baffled me. It seemed almost flirtatious the way they carried on, it made my head tilt like a corgi. Let’s be clear, I’m too old to be their mother. Or maybe they were flirting with each other? I don’t understand men. As they stacked the hay in my barn, I off-loaded 30 bales to the back of my truck to take to another spot. When I got back from stacking my load, they were still chipping away at their 60 bales, doing more talking than tossing hay. I was thinking of telling them that they throw (hay) like a girl, but they aren’t that good, and I know how fragile baby bull riders can be. It’s an old insult, to tell a man that he throws like a girl, but the insult never made any sense to me. I had a high school P.E. teacher who retired from fast pitch softball and I caught a few of her pitches. I mean, Serena Williams plays tennis like a girl, doesn’t she? I think the original meaning is lost and now might be the time to really take some pride in it. Are you that strong? No bragging, I know I’m not out of the ordinary for my lifestyle. I have a lot of women friends who throw even more like a girl than me. But I am doubly dangerous, I am no longer a demographic. I turned 59 this week. They can’t sell me cosmetics, or kitchen doodads, or a vacation home in Arizona. Advertisers think I no longer exist, as does a good segment of the population. It’s kind of liberating. Beware the old gray mare: I’m not dead yet, and I throw like a girl. Yes, beware the old gray mare – she’s learned where to aim her kick! Great comment! We are work out sisters!! Anna i just loved this you are so right on the button. I too am getting to the old grey mare status and yes i proudly throw like a girl!!!! Emily, you Old Gray Mare, I hope we are word wrestling forever! That’s much more of a challenge. Thanks, and Onward! Amen, sister! Death to all those fancy workout gyms!! Give me barn chores and lugging dog show equipment any day. All that has saved me from the osteoporosis that plagued my mother. Thank you, Lord, for all the work that horses and dogs entails; you knew exactly what we needed to stay healthy! I’m always amused when my doc asks me if I do a lot of weightbearing exercise… guess what? I have horses! What fun to read! Perfectly put… I’m a 58 year old instructor / trainer with my own stable (on my own) and I appreciate this. 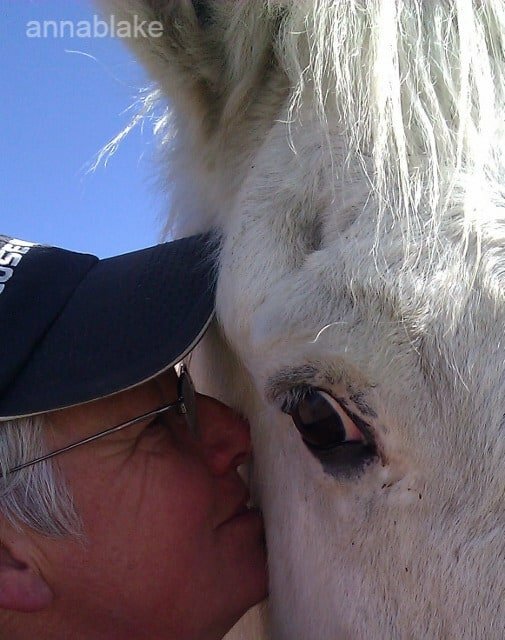 I am 57 and am still working toward owning my own horse. I have mucked many a stall and groomed many a horse for friends. I too get nauseous just walking into a gym. But the most perfect part of your piece is about using “like a girl” as a derogatory statement. I have long wondered why that is derogatory. I think it adds to the strength of the patriarchal society we live in, adds fuel to the fire of not respecting women, especially in the military. How refreshing to hear someone else finally put it into words on “paper”. Thank you. Thanks, Lynne. I so agree! I just now received this via facebook. I am 74 years young, and totally agree. Farming, raising your own hay (which has to be hauled and stacked), raising and caring for horses/ponies, and dogs entails lots of lifting, stretching, throwing, shoveling, the list goes on. I believe I owe my good health to this activity. Recliners and remotes are not in my schedule except after chores and supper is done. TV is better than sleep aids for putting you to sleep. My cousin shared this post on FB, and I LOVE it! I am about to turn 52, and take care of a bunch of critters on our five acres while homeschooling an 11-year-old(!?!). My son wouldn’t understand the meaning of “You throw like a girl;” he’s caught my baseballs, footballs, Frizbees, and can’t keep up with my hay-stacking (although I admit to looking forward to the day when he can). Anyway, I’m a follower now; looking forward to reading more! I have a couple blogs, one is a general “farm” blog and the other is my horse/training/dressage blog. You’re welcome to visit! What a great blog!!!! I am 53 and have 6 acres. Dad is 84 and helps around the place. Between the 2 of us we can work these “young-uns” into the ground easily! Dad hired a 15 yo to help him with some yard work and after 1 hour Dad had to drive him home because he didn’t feel well….guess who never came back? LOL! We need to start an Old Grey Mare Club!!! I’m up for the OGM club! Has no bright spark yet worked out how to plug all those exercise machines into the national grid so the calories expended are put to good use supplying energy 🙂 (Or maybe someone has and the power suppliers are keeping us in the dark!) Happy birthday Anna – will catch up with you in a month or so. Wow, your million dollar idea: treadmill power plants, you are a genius! If you can patent it, I’m happy for the proceeds to go to Infinity Farm and Ruby Ranch! Love this idea, Like wind power only better. Amen to the multiple benefits of Chore-gercize! I had a bone density scan done in my mid 50’s-scores were off the charts higher than for my age group. When asked my daily routine (we only have 3 to 4 horses on 5 acres but at the time I also was in charge of a research teaching herd of young horses) they said “that explains it!” At 62 I just suffered my FIRST ever broken bones-a couple of ribs from a voluntary but emergency dismount from a young, tall strong horse moving at warp speed toward a road (he stopped when he realized he lost me and trotted back-he was just having “fun”!). Considering the other contusions it is a miracle nothing else broke! Old grey mares-UNITE! don’t let people tell us we are too old to do what we love to do! Yay, good for you! Maybe we are our own demographic! Just read the rest of your site. We also share the love of dressage and Colorado. Spent 7+ years in Ft. Collins teachi9ng at CSU….WE are a unique demographic! And you are very welcome. Okay, I agree we do need a club. I’m on it! I just received this via facebook and enjoyed it a lot. Work out, what for? Howdy back… I think being an Old Gray Mare is all about sanity in a crazy world. Of course, we each get to be the judge of that! Welcome!! I’m 56 and I have two steel rods and six titanium screws in my back. I’ve been lifting weights (in a gym) since 1981 and working on farms since I was 12. I can say for certain that I can out last almost anyone on a hay field, buckboard or up in the hay mow. Not that I want to …. but sometimes I don’t have the luxury of a choice. I actually believe working out in a gym is good for you because it lets you work on your weaknesses and be better balanced. Like anything else, when we do certain chores repeatedly we build strength and coordination in some areas, but not in others. It’s those weaknesses that are often the first to fail and sideline us with injuries. On another note … are you doing OK and surviving the horrible rain storms? Keeping my fingers crossed you are all safe and sound! Point well taken, and tough as steel and titanium!! The floods are bad, and our pond has been a problem, our road washes out often. But the animals are safe, we have been lucky. It has been a hard summer for Colorado. Looking forward to a new year already.